If you've ever been in the distressing position of having your partner dislike your cat and pressure you to get rid of him, you know how upsetting it is. While some might find the decision easy one way or the other (getting rid of the cat or telling the partner to get lost), most people would rather find a way to make things work out between the two. If your partner says you must get rid of your cat, the first thing to do is remain calm and have an honest conversation about the issue. You must first determine the exact reason(s) your significant other has for asking you to do this. If the problem is inappropriate urination, you must first take your cat to the vet to determine if there is a medical problem. If there isn't, you need to determine why your cat is urinating outside of the litter box and fix the problem. Begin by ensuring that you're doing a great job of keeping the litter box clean because cats are very sensitive to dirty boxes. You can learn more here: "How to Clean the Litter Box." Don't let your cat sleep in the same room as your significant other, and keep that room off limits for your cat during the day, as well. Nothing exacerbates allergies as much as having your sleeping area immersed in allergens. Use a good vacuum with a HEPA filter and vacuum daily. You may also wish to consider a central vacuum for your home. Vacuum your cat's bedding and any areas where he hangs out a lot daily, as well. Give your cat good alternatives to sleeping on the couches and chairs. Help keep seating areas free of cat hair and dander by keeping your cat off of them. Instead, invest in great cat beds and train your cat to use them. Posts like the Mondo! and cat trees like the Purrfect View offer wonderful, cozy cat beds along with prime scratching surfaces. Wipe down walls and dust often. These are housekeeping tasks that aren't often considered essential, but when someone who is allergic to cats is living with them, it's crucial to do them at least weekly. Change the furnace filter often. This can reduce the amount of pet dander that gets thrown back into the air. Consider getting rid of the carpet. It's much more difficult to get pet allergens out of carpets than off of hard floors. This is the case for other allergens, as well, so if someone in your home has allergies, consider getting rid of carpeting. 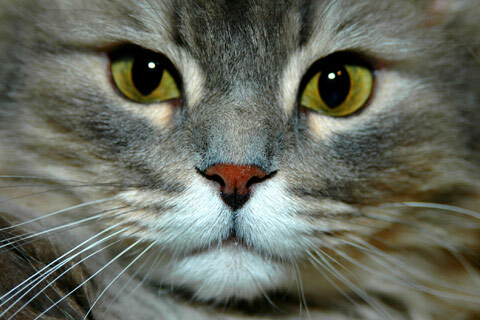 Allergy shots for the person who is suffering from cat allergies can decrease or eliminate the symptoms over time. This is not a quick fix, but if your partner is willing to consider allergy shots, have him or her talk to the doctor. If your partner dislikes cats in general, the reasons are usually related to cleanliness. Use the same techniques above to keep the cat hair levels as low as possible in your home and maintain as clean of a litter box as possible. You may also wish to give your partner "cat free" areas of the home to enjoy, such as the bedroom and family room. Train your cat to stay off the kitchen counter, too, which is something that many people strongly dislike. If the problem is inappropriate scratching, you will need to train your cat to scratch the proper surfaces rather than your belongings. First, don't declaw. This is an inhumane surgery that is painful and has lasting effects on a cat. Learn more here: "Declawing Cats: Alternatives to an Inhumane Procedure." 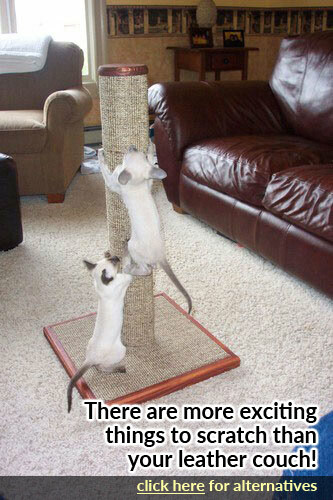 Get great scratching posts. Cats don't like to scratch wobbly posts or those covered in a material that catches their claws, like carpet. They prefer strong, sturdy posts that are covered in sisal fabric or heavy-duty corrugated cardboard. 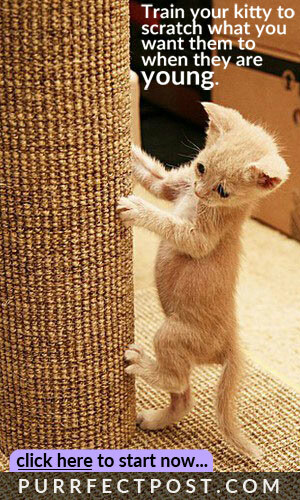 You can learn more here: "How to Choose the Best Cat Scratching Post." Make the inappropriately scratched items unappealing to your cat. You can do this by covering chair arms with a heavy, tucked in blanket, spraying surfaces with cat-safe citrus sprays, or using double-sided tape on areas that won't be damaged by it. Make the scratching posts as appealing as possible to your cat. Sprinkle catnip on the post, play with your cat with a wand toy near/on it, and give your cat praise and attention when he uses the post to help him get used to using it instead of your other belongings. Reduce your cat's stress as much as possible. Stress can lead cats to increase their territorial scratching behaviors, so keep your home as calm as possible. Consider using Feliway to help combat feline stress. You can learn more here: "Is Your Cat a Stress Scratcher?" Go through the steps in this article for more in-depth help with inappropriate scratching: "Train Your Cat to Stop Scratching Your Couch in 7 Days or Less." Use Soft Paws® to help combat the damage done by inappropriate scratching while you work to get your cat scratching his posts instead. Remember, relationships are all about compromise and finding what works best for all members of the family, including the furry ones. If you absolutely must remove your cat from your home, try to find him a safe new home yourself or contact a rescue group. Simply letting your cat outside or taking him to a shelter could result in injury or death.